The vision of the pool from the living room of the cottage is a delight every moment. 4 burner gas stove, dishwasher, hood and all necessary kitchen. * A seating area with sofa, TV, DVD, radio. * Bedroom 1: one double king size 2x90 cm, storage. * Bathroom: Italian shower, basin, WC, heated towel rail, hairdryer. * Enclosed courtyard of 90 m², part of which terrace of 20 sqm in front of the holiday cottage * Parking for one car in the yard. * Storage for bikes and sports equipment. * Baby cot and high chair available on request. * The owners live on site in another party, independent from the farm. Geneva (Switzerland) and Lake Geneva. less than 20 minutes by car (equipment required in winter snow). In summer, near three lakes can enjoy water pleasures at the map without tiring. We spent a week at the property and thoroughly enjoyed our stay. The kitchen was well equipped, there is a washing machine (essential with a baby!). 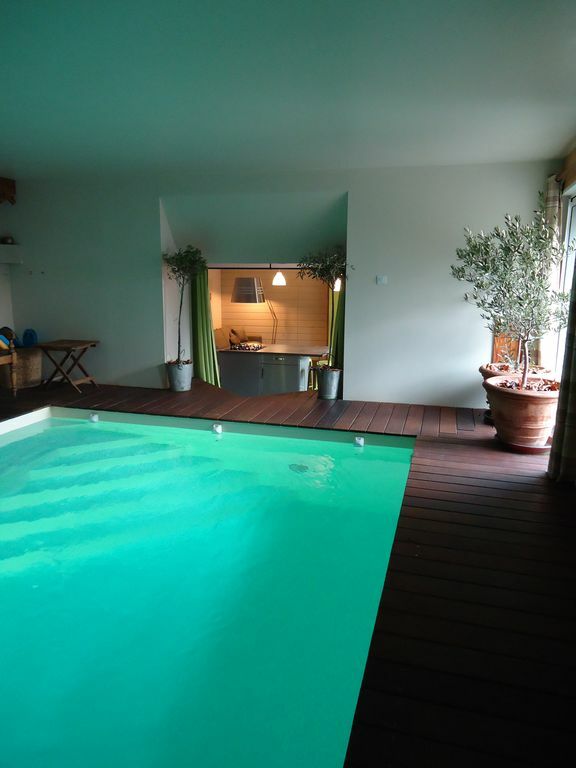 The terasse is private and the swimming pool is lovely and clean- a great facility. Comfy bed and sofa. High chair and cot we’re waiting for us when we arrived. The surrounding countryside is gorgeous & the local auberge is good.